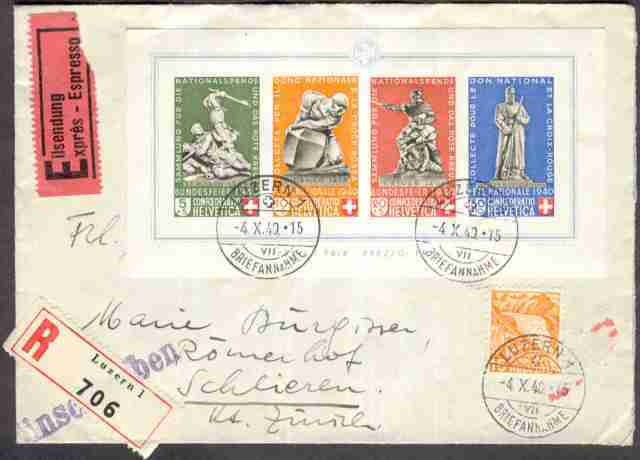 This registered express cover was sent from Luzern. It has three Luzern CDS. There is an Einschreiben handstamp under a preprinted Luzern 1 registry label. An express (special delivery) label has been added. water slides, about 7 km west of the heart of Zurich. It is likely a sub-office of the Zurich Post Office. It arrived there on the same day. This was not surprising since the total distance traveled was probably less than 50 km. 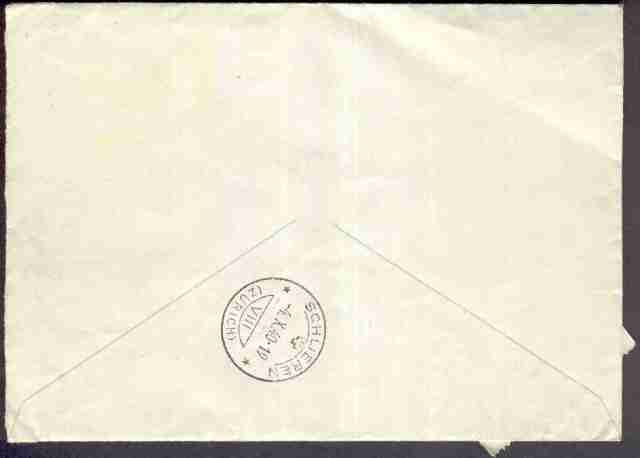 The cover is franked with the National Fête Day semi-postal of 1940 souvenir sheet. from the earlier 1940 National Fête Day semi-postal set. The surtax was for the benefit of the National Fund and the Red Cross. a 20c + 5c brown red, black and red, and a 30c + 10c chalky blue, black and red. This sheet has a nice used catalog value (Scott B105).